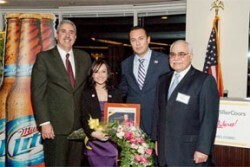 MillerCoors recognized Andrea Delgado, a national environmentalist who was recently named the MillerCoors Líder of the Year, during a reception. Delgado is a Senior Policy Analyst and Communications Manager for the Labor Council for Latin American Advancement (LCLAA), a national non-profit that works to educate, empower and increase opportunities for Latino workers and their families. Delgado will use the $25,000 Líder of the Year award to implement a leadership initiative between MillerCoors and LCLAA. As the winner, Delgado received a $25,000 award grant from MillerCoors, which will help fund leadership training for Latina LCLAA members. The training intends to enhance the skills and qualities needed to empower these women to reach their goals in helping their communities. The women will also generate awareness of issues that affect their communities, specifically environmental protection, conservation and stewardship.